Ooh look at me…! Aha that feels better…! In spite of all the brouhaha about the killer Raoul Moat on Facebook the social networking site is not as negative as you might think. New research shows that it is actually quite good for you. 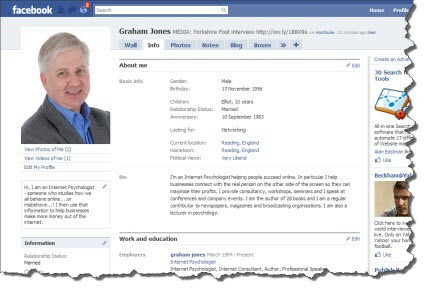 Cornell University psychologists looked at the use of Facebook and self-esteem. And there’s a finding they reveal which could do you the power of good. What they discovered was that people who update and check their own Facebook profiles have higher measures of self-esteem than people who do not. It seems that people who selectively present themselves in digital form – and make regular checks on their self-presentation online – have a more positive self-esteem rating than people who don’t do this. So, that long-lost art of “Googling Yourself” is something you should actively take up, it would suggest. So too is updating your profile on any network you use and then checking it. But wait a mo…before we get too narcissistic…isn’t there another reason for doing this kind of thing? Yep. You guessed right..! Updating your profile is essential. Imagine for a moment you are round your neighbour’s house. You tell them exactly the same information about yourself as you did the last time you were there and the time before that. Guess what. This is probably your last invite round their house; they are bored with you already. Now go round your neighbour’s house and tell them something else about you, something they don’t know. Who is the life and soul of every party? The cheerful chappie who always has something new to say, not just about themselves but about other people they have met. If they only meet people who said the same stuff all the time, the life and soul would depart from our cheerful chap. Social interaction depends upon new information; at its very foundation is the sharing of new details about each other and about others in our social network. Yes, you might like to call this gossip, but studies show it represents around 75% of our social interactions – even in business meetings. If there is nothing new on your profiles on the web, your social contacts have little extra to say about you. In other words, your social profile becomes – well, less social. So, not only does updating and checking your profile make you feel better, it will also give your contacts more to think and say about you, thus enhancing your online sociability. And that, in turn, will make you feel even better. So, go for it. Check your profiles, change them and do it regularly. You will feel better and you will give your contacts more material to think about and talk about, which ultimately will deepen your relationships and thereby bring you more business.